It’s hot and windy with a flying hat warning. 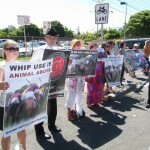 We all slink into the racecourse past a line of protesters, who make us feel guilty about having to whip the horses. 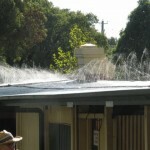 There are some concessions to the heat – members don’t need to wear ties, there are sprinklers on top of the horse stalls, and the horses are allowed to arrive on course later. But a major irritation is that they barely do half a lap of the mounting yard with the jockey up before being whipped out onto the track. This makes it much harder for horsewatchers, with less time to see them out the back and in the yard. 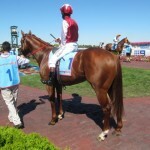 The Sydney horse Upbeat, who won the third, was the only mildly heat-stressed horse that I noticed. The vet was called and the horse was quickly cooled down. 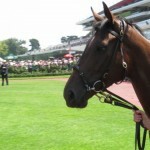 But all the good horses are back, including some of my old favourites – Sepoy, Mourayan and Niwot. Sepoy has filled out and has a lovely glossy coat, but in retrospect was probably a bit burly. 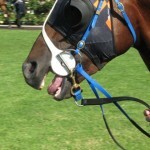 Mourayan was a touch excited in his stall, and Niwot, my Cup bet, ran on fairly. The standout of the day was Samaready who paraded around the mounting yard, as someone said, “like an eight-year-old”, but was too short at $1.40 the place. I didn’t have a bet all day, mainly because I was left with too many good horses in each race. But I was saving myself for the last, the mares. Hi Belle, was a standout, so I backed it and then went back and backed it again. She won like a good thing. Home, in good spirits, but in need of copious rehydration and refreshment. I spent most of the day trying to photograph bridles and bits. I missed getting a bubble cheeker but managed a half-decent picture of Liveandletdie’s cheeker. 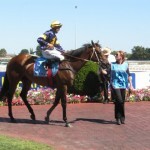 Cheekers are most likely positive and certainly didn’t impede Liveandletdie who won the last convincingly. 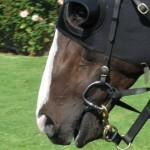 I managed a good shot of Rockpecker’s tongue control bit, but if you don’t know whether the horse is wearing one it is virtually impossible to tell from the bridle. In contrast you can spot the Norton bit from the bridle quite easily and can distinguish the Norton from a bit lifter by the type of attachment. 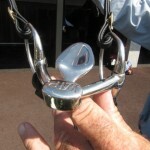 The bit lifter is buckled around the loose rings whereas the Norton bridle attaches directly to the bit. I don’t have enough data yet to decide if the Norton, the bit lifter and the tongue control bit are positive or negative. 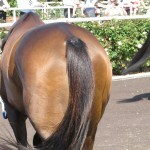 I spent so much time looking at bridles that I nearly missed the champ’s race but managed a glimpse of that famous backside. Everyone poo-pooed me when I said I was disappointed that the final sectional wasn’t 10 seconds, but apparently she did run the 600 to 400 in 9.98, so I can’t really complain. And not much punting. I backed Liberty Rock for a strong second in the first at $1.80 and then didn’t butter up again till the last, when I did my dough on Testascana. A losing day. My first for a while. I feel like Hay List. Free entry and free kisses. The club is really turning it on today. No wonder there are 20,427 people here, widely reported in the media as over 30,000. 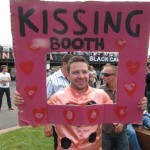 The only problem is that you have to smooch up to those whiskers to get a photo of the kissing booth! Prickly! They are five deep around the parade ring for the champ’s race. 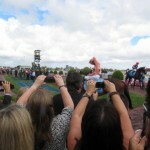 And there’s no way I’ll get a look in the mounting yard. 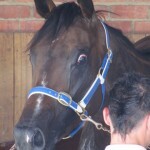 But going back to the stall you can see what all the fuss is about and what all the other horses see. 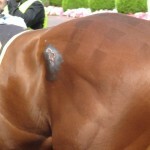 The champ’s backside. As the superlatives of the experts click into overdrive what can an ordinary punter say? 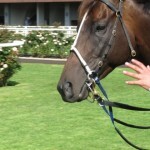 Black Caviar is a very fast horse. With so many people here and cheap beer on offer it’s hard to find a place of peace and quiet to think. I start off badly with Applegate who is slowly away and never recovers, redeem myself with a nice placing by Veewap in the Carlyon Cup and consolidate with Hot Spin’s third in the Rubiton. I noticed that Grand Duels looked like it copped a slash in a sword fight. By the time of the last race, the mares, the crowds have deserted the parade ring. Three horses look the goods. Hi Belle, Psychologist and Irish Dream. All are relaxed. Wait a minute. Psychologist relaxed? This horse is normally a head up, changing gait horse. In other words aroused, fractious. Maybe she’s seen a psychiatrist. The contrast between the horse’s normal behaviour and today is simply startling. Got her head sorted. And so it proves. She brains them at $4.00 for the place. Three out of four. Not too bad a day. And I didn’t get too grumpy about the crowd getting in the way. 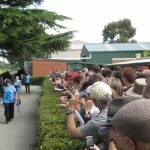 After all, it’s good for racing, which is good for horse watching. I missed the Arabian mile race at the start of the day but caught up with my old mate Franshar Park K Shar in his stall. He won the race last year as a 14-year-old but this year only managed second as a 16-year-old, according to the race book. That’s what happens as you get older. You slow down and the years go twice as fast. 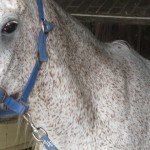 And I learnt that his coat is not simply grey, but described as “flea-bitten grey”. A lovely horse! Another of my old favourites was on show today, the American Cannonball. He first appeared in this blog back in January 2010 ridden by Pat Valenzuela, who had form himself with 11 suspensions for substance abuse. The horse simply exploded that day. 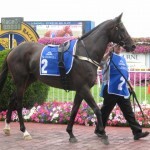 Since then he’s had a sojourn with Gai in Sydney, but never settled, and is now with Pat Carey at Mornington. His racing style was to take off like a scalded cat and then explode on the turn to finish tailed off at the rear. 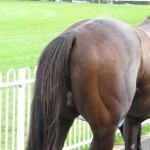 I had a good look at the horse in his stall and you would have to say that he is a physically very impressive specimen. And very fit. His behaviour seems much improved too and he appears much less bullish, with just a few minor niggles in the mounting yard. They jump and he sits outside the leader, half a length back. This is not my mate, the old Cannonball! Pat has trained him to settle. And he fights on well to hold second at 80/1 with the books. I didn’t back him, but it just goes to show that there is hope for all miscreants. I had a nice place bet on Twilighting, but was too busy backing it to lay the favourite, Le Societe, who was showing some terrific white eye. My standout for the day was Bolton, who looked totally stunning. No photograph because I was in too much awe. And too short at $1.30 for a place bet. But would you believe I had a small token bet on the horse for a win. Just to prove to myself that I was right. And a nice finish with Parthian. Not too bad a day. Two and a bit out of two.